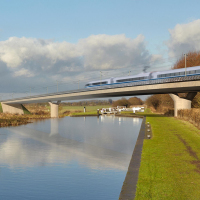 Bombardier Transportation, which is currently bidding to win a £2.75 billion contract to build the HS2 high-speed trains in partnership with Hitachi Rail, is the company behind the claim. Bombardier is currently developing technology that would enable click-and-collect services on board the "very convenient and very passenger-centric" 225mph trains. Martin Rennoldson, sales director at Bombardier, said: "You could pre-order your coffee or sandwich. It could be that you pre-order and arrange to collect your Amazon parcels. "The train would enable lots of things, so we'd certainly work with the operator to develop the wider passenger experience." He added: "The journey that (passengers) take on high-speed rail could be a very productive period for them, not only work-wise but for their private life, shopping and comfort." The Bombardier-Hitachi joint venture is competing against four other shortlisted bidders - Alstom Transport, Patentes Talgo, Siemens and CAF. Mr Rennoldson said digital technology could also allow passengers to use their smartphones to alert train crew to issues such as problems with a toilet or lost property. "We want to make sure that is all possible," he said. A new franchise known as the West Coast Partnership will be responsible for designing and running the initial high-speed services when phase one opens between London and Birmingham in 2026. The railway will then be extended to Crewe, Manchester and Leeds. If you're planning a trip in the UK, make sure you have the right cover for you by checking out our dedicated UK and Channel Islands travel insurance.